As Wes Madiko's Cameroon lullaby, "Sweet Bitowo", played softly in the background, we drove over the narrow bridge crossing Wilderness' Kaaimans River, and onto the dirt road... very conscious of the fact that, should we get stuck, there was no hubby there to dig us out (and babies aren't usually super cooperative in crisis situations). Despite the road's uneven nature, we got through just fine in our little Volkswagen Polo, and when we reached the end, we surveyed the area, spotted a group of friendly locals having a good laugh nearby, and decided to get out to explore. I had a few munchies with, and Lukas and I sat down on the banks of the Kaaiman, where we ate under the watchful eyes of the Knysna-Lories, perched in the jungle-like canopy of trees behind us. Lukas wobbled to and fro behind my back, "surprising" me and giggling as he appeared on my right, and then my left. We walked along the river, wary of any potential quicksand (riverbeds can be very misleading here in South Africa), and Lukas bent down to splash in the water. After a half an hour, we decided to move on. 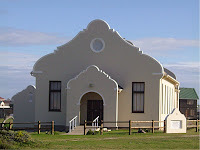 The plan was to visit the beach (Wilderness has amazing beaches), but since Lukas was tired, and there was a strange fog hovering over the coast, we headed back to Mossel Bay... along our favorite stretch of coastal highway. That was our spontaneous adventure Thursday. Since then, we've just been packing, packing, and packing. Friday was the day that all of our stuff got loaded into the container. Lukas and I also took another stroll around the neighborhood, taking some neat photos of the pin-cushion proteas, aloe plants (complimented nicely by a bird feeding on the nectar! ), and a pretty purple flower that I don't yet know the name for. Yesterday we canceled our phone, visited the George Strawberry Farm once more (without a camera of course), spent a bit more time at Mossel Bay's Point, planned the first few days of our road trip, and had dinner with friends at Café Havana. The plan for today was to leave early, and head into the Klein Karoo, staying at the 4-Star Ladismith Country House on the first night, and at a guest house in the town of Ceres (known as the Switzerland of South Africa) on the second night. Well, that's still pretty much the plan, it's just the leaving early part that seems to have changed. On that note, I have to run... have some last-minute packing to do! I hope to find an Internet Café along the way somewhere, so I can keep you up-to-date on our adventures! Yesterday marked a couple exciting milestones for me. In addition to my writing appearing on www.globorati.com (Overland Down Under), Mom sent me a copy of a small article that appeared in the Travel Section of last Sunday's Miami Herald, regarding one of my pieces. On a more serious note, yesterday I finally had the opportunity to meet with some local South Africans that are doing everything in their power to make a difference. Their goal is to help feed and clothe some children in a local "squatter" camp. What I find so sad about South Africa is, that the country receives so little money from various international charities - who focus more on Somalia, Ethiopia, etc. But if you saw these little children, living in sheds with huge holes in the roof, sleeping on soaking wet beds, running around without shoes or jackets in the winter, and drinking only a glass of imitation orange juice for breakfast, your heart would break just the same. Not only do they receive so few nutrients, that their brain development is often years behind that of "normal" children, but the awareness level of the parents and caretakers is alarmingly low, leaving them completely bewildered when their children's teeth rot out of their mouth after they've been given bottles of coke regularly for the first year. But to get back to this organization, their goal is to eventually set up a type of sponsorship program, to allow people to directly sponsor one child, visit them if they'd like, and receive pictures and information. But the short-term goal is to help get these children's immediate needs taken care of. They spend the day at a make-shift creché, or day-care, which is usually one woman, looking after far too many children, with too little money to properly feed or clothe the children who she's looking after. They're usually not bathed, and most have little or no immunizations... some have never even seen a hospital, clinic, or doctor. In any case, I promised to help in any way I could, from wherever I am in the world. It's so nice to meet people that aren't turning a blind eye to the immense poverty around them. It's incredible to think of what South Africa could be, if more people would stop depending on the government to make the change that they want to see in their world! Wilderness and Mossel Bay's "Point"
Yesterday wasn't the most stress-free Sunday, but we did get a lot done. I had a golf lesson, we packed (a few things, anyway), we visited Wilderness (and the "Map of Africa"), and we met a friend for coffee back in Mossel Bay. And now I'm back to packing. Although I'm still a bit sad to leave South Africa, I am starting to look forward to getting settled in our next locations (even if that is several months away). I promised to give you an update on last week's trip to Cape Town, and here it is! To begin with, I've uploaded a few photos of the trip, including a picture of us at dinner at Savoy Cabbage, the view from our hotel room at the Victoria & Alfred Hotel, the Waterfront at dawn, the cozy Coffee & Bites café, and a photo of Nobel Square (just next to the Hotel). After my last Cape Town posting, we ended up meeting a really neat Aussie mom (and her "tot") at the Waterfront. We had so much in common, which is why Lukas and I decided spur-of-the-moment to join her and her son for a local La Leché meeting (such a neat organization! I hope to get more involved with them in The Netherlands.). After she dropped us back at the Waterfront, we did a bit of shopping (I shopped, Lukas slept - YAY! ), then had a coffee at "Coffee & Bites", in the mall. From there, returned to the hotel, got changed quickly, and got into the taxi to go and meet Tobi in Blauberg. Dinner was at a neat little restaurant, fittingly called "On the Rocks", and although the service was super slow, the food was great (and Lukas was on his best behavior!). The next morning, we had breakfast at the hotel, overlooking the harbor and Table Mountain, then did a bit of last-minute shopping before heading back to Mossel Bay. The trip was pretty uneventful. I wrote, Lukas slept, and Tobi drove. We arrived in Mossel Bay around 3 PM, and Tobi headed to the office. Tomorrow should be a little more exciting. We plan on having lunch in Wilderness, followed by a family hike. Hopefully we'll have a few new photos for you as well! The friends I wrote about on Thursday seem to be doing well now, and it looks like their little boy is going to be fine (although he'll have to have a few surgeries in his first year). We're so happy for them, and can't wait to meet their little "bundle of joy"! Visiting Victoria Bay and Wilderness today left us in awe, but this was quickly tempered with the news that friends of ours are coping with a premature birth and (hopefully mild) birth defect. It appears to be an esophageal defect, that happens very rarely, and just leaves you asking why? It's only natural to put yourself in the shoes of your friends and/or loved ones when they encounter something like this. Feelings of fear, accompanied by hopefulness run through your head, and you just pray that everything will be ok, with time. Please keep our friends in your thoughts as they deal with this. They're also expats, and I can't imagine how difficult it must be to cope with all of this in a "foreign" country. And you've had the perfect morning. A family breakfast, followed by a walk along Cape Town's Waterfront, and a take-away cafe mocha to enjoy while writing back in the hotel room. A new marimba CD is playing on a rented laptop (that incidentally has more than 15 minutes of battery life, allowing you to write from bed, as you're getting the baby to sleep). And your little boy falls asleep without protest. Could life be any better? Of course, no adventure would be complete without some unplanned hiccups. Over the past few days, we've experienced the torrential rains that are characteristic of Cape Town in the winter, a drive through the Constantia Wine Region (save yourself the trip if it's overcast), and have eaten at one of CNN's "hot spots" for Cape Town - Savoy Cabbage, which, although nice, doesn't compare to our all-time favorite Cape Town establishment... Baia (no official website). What did impress us was the fantastic Cape Standard guest house, as well as the popular seaside walk along the Sea Point Promenade. A fantastic companion for Cape Town, which I've been reading at every opportunity, is the book A City Imagined. I highly recommend it for anyone who has ever lived in, visited, or dreamed about visiting South Africa. Once Lukas wakes up, our plan is to check out a couple nearby hotels, then head to the Two Oceans Aquarium, which is just 10 minutes away from where we're now staying (the Victoria & Alfred Hotel). And tonight we'll be having dinner North of the city center in the Blauberg area. We're off to Cape Town for a few days, but I just quickly wanted to write that we had a fantastic hike in George yesterday, and I'll try to write all about it from Cape Town. 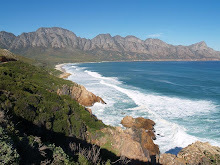 I have this fantastic, indispensable travel companion for South Africa, called Touring in South Africa. It's such a great resource for road trips, but not surprisingly, there are lots of great road trips that you won't find in the book - one of which, we stumbled upon yesterday. My in-laws stayed in Stillbaai a few months back. Since I hadn't yet been there, and it's just over an hour away (from where we live in Mossel Bay), I suggested they take us there for the day. I wasn't expecting much, since all I've heard about Stillbaai is that it's "very, very quiet". The nice thing about having low expectations, is that your often pleasantly surprised. Stillbaai's remoteness makes it a safe, clean little town, with incredible beaches and and extensive network of coastal hikes. As far as eating is concerned, I'd suggest bringing a picnic lunch. The café we ate at ("Matchbox") had a nice ambiance, but the meals and service left a lot to be desired. It was a great spot for kids though; the little enclosed playground, complete with chickens and ducks, was great fun for Lukas, and was surprisingly tidy (are the birds potty trained?). Not wanting to take the same route back, I called a friend to see if the coastal route (marked ("Gouritzmond") was safe to take. She said it was a "very good road" - which I understood to mean "paved". Wrong. Although a good portion of the road is gravel, it was so beautiful that we soon forgot that we were on a dirt road. And for most of the journey, we had the road to ourselves, allowing us to stop whenever we wanted for photos and fresh air. The air smelled sweet, like honey, which we soon realized was coming from the white flowers lining the side of the road. Coupled with the protea-filled fields (which were in full bloom), and large flock of Blue Cranes (which is coincidentally the South African National Bird), the journey was truly a full-sensory experience. We enjoyed every minute of the trip, and were so glad that we decided to take the road less traveled. For someone who is a complete mess when it comes goodbyes, I sure do say a lot of them. If you were to spend some time with me, this might come as a surprise. I'm usually very strong, stable, and happy, but when it comes to leaving friends and family, I'm a blubbering mess. On Monday, Rijanah (our nanny) had a bit of a strange expression while she was here at the house. It bothered me a bit, but I didn't say anything. Then, when I dropped her off at home, it occurred to me that she was probably just sad that she'll only see us a few more times before we go. And there, in the township, I broke down. Picture a silly white lady driving through the township w ith tears streaming down her face. That must have been quite a site. (I did manage to take this photo, though - I find it such a contrast to see shacks set against the backdrop of the beautiful mountains). And worst of all, I had to stop at the grocery store with my big, bloodshot eyes and tear-stained cheeks. Wouldn't you know that I'd see someone I knew! One of Lukas' babysitters (a friend's daughter), waved at me from a nearby car. Oh well. Other than my emotional state, there's not a whole lot new with us. My in-laws arrived yesterday, and we'll be driving to Cape Town with them on Sunday. Oh, and the publisher from globorati.com contacted me yesterday. They've asked me to write for them, which I'm very excited about! Today we're headed to Stillbaai for a bit of exploring, and tomorrow we'll head to George for TopTots (hopefully stopping to check out the strawberry farm on the way home). I guess that's all for now. I'll write more once I've collected some more exciting experiences to share with you! I began the day by walking the dog. The sun was just rising, the early birds were on the move, and the full moon was still on the horizon. Geese flew over head, squawking in their characteristic goose-fashion. Dawn is such a magical time of day! From there, I got in the car and headed out to George for a First-Aid course, which I've been wanting to do for quite some time (does anybody ever remember the ratio of chest compressions to breathing?). The drive to George was picturesque, as usual, and after the First-Aid Course, I decided to roam around the city center a little bit, checking out a few cute cafés and shops (if you're ever in George, you MUST visit "The Conservatory at Meade House" - it's so lovely!). And then it was back to Mossel Bay, to check on the boys, and see if I could convince them to go on a hike in the afternoon. Tobi's coming down with a cold, but the weather was just too perfect to stay inside, so we headed back to George to check out a trail leading into the mountains (from the Botanical Garden). We brought Felix along, and he was in doggie heaven. Strangely enough, I have two hiking books for this region, and the trail that we took isn't in either of them. From the Botanical Garden, you can either take the shorter hike, past the railroad tracks, through a forest, and then onto a little stream, or you can walk all the way to the George Dam (which we'll have to do next time, as it requires a bit more time). Since Tobi's not feeling well, I volunteered to carry the baby backpack, and Lukas really seemed to enjoy our hike. Arriving back at home, we looked out to the ocean, and spotted a strange fiery ball on the horizon. It was the moon rising, and although we tried to take some photos, none of them really came out (we have to take a photography class when we're back in Europe!). Yet another amazing South African moment committed only to memory. "Cantering is easy, you just sit back in the saddle and relax." Uh huh, right. How about I just hold on to the saddle with all my might, and let out a high-pitched squeal when I begin to feel out of control? That's right, I went horseback riding today. My guide, Lucinda, was new to Botlierskop, but she knew a lot about horses & the wildlife. While riding, we spotted rhino, wildebeest, kudu, and elephants, not to mention lots of beautiful fynbos. I really love Botlierskop and have been on many game drives there, but this was definitely different. On horse, not only were we able to get much closer to the plant and animal-life (sans the constant purr of the motor), but we could stop whenever we wanted for photos, or just to admire the incredible view. Plus, it was a 1-on-1 tour, meaning no other tourists would be spoiling the silence with loud chatter in various foreign languages. The 2-hour tour was 400 Rand. But half of the fun of going out to Botlierskop is, you guessed it, the drive! I think it's one of the prettiest drives out here. It only takes me about 30 minutes to get there, but that's a half an hour of mountains, cattle, pastures, picturesque farm-houses, and little "colored" kids waving as I pass. But ohhhh, my bum. It's already sore, a mere 4 hours after my return. If it hurts now, just imagine what it's going to feel like tomorrow. C'est la vie!